Come home to the serenity of the hills. Your very own italian villa up in the city. Where stunning terra cotta hues glow in the warmth of the sun .Townhouses and condominiums that welcome you to the spirit of Italy... the beauty and comfort, the luxury of a classic abode. Come home to an Italian renaissance, where modern comforts meet the joys of a time-honored lifestyle.Live in your own private space, in the spirit of rustic Italy. Live in the enduring legacy of countryside citadels, and bask in the beauty of a sun-drenched abode.La Citadella conjures the beauty of classic Italy and the comfort of a modern home. It is Cebu City's new elite address in the hills, overlooking the city and conveniently located near the busy Banilad district, accessible to private hospitals, shopping malls, schools and recreation centers.Nestled in the tranquil hills of Talamban is an Italian haven - a place you and your loved ones can truly call home. La Cittadella is a dream Italian Village, with the sophistication of Italy's architecture and taste, reminiscent of old world charm and blessed with the wonderful warmth of the Italian countryside.Enjoy all the convenient amenities of modern family living, 24-hour security and proximity to Cebu's major business areas. La Cittadella offers you the best of both worlds: a sheltered community that provides the wonderful perks of modern living, and accessibility and convenience of location.With an array of modern units to suit your needs and budget, La Cittadella promises to fit your special lifestyle, whether you are a young couple embarking on your dreams or a family that enjoys the comfort and luxury of a modern home. Because we all deserve to live life, and live it well. 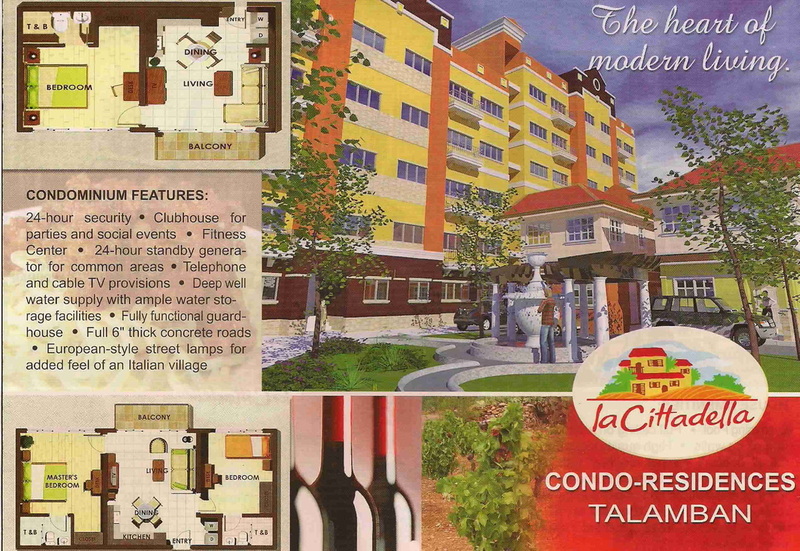 Kindly mention "LA CITTADELLA CONDO- RESIDENCES" with your comment in the comment box when you have inquiry.